Atlantis Foundries manufactures commercial vehicle engine blocks for all of the blue chip international truck manufacturers. The list of manufacturers of trucks that the company supplies is an indication of the quality standards demanded of and achieved by Atlantis Foundries. Atlantis Foundries supplies commercial vehicle cylinder blocks to the engine plants of Detroit Diesel, Mercedes-Benz, MAN, Perkins and Cummins. The engines in turn are supplied to manufacturers such as Mercedes-Benz, Caterpillar, Western Star, Mitsubishi Fuso and Freightliner. To further improve the quality and cost position of Atlantis Foundries, they have embarked on an ambitious plan to build a Smart Foundry. The basic building blocks for such a concept are robotics, process instrumentation, and the tracking of components using RFID and other software applications. With all the data available and it being traceable to individual castings, the door has opened to enable the use of Artificial Intelligence for process control and inspection of components. “The corner stone of the project is the programme of automation in the foundry. The Fanuc robots installed by Robotic Innovations have become the workhorse to carry instruments that acquire data while handling or performing its operations. 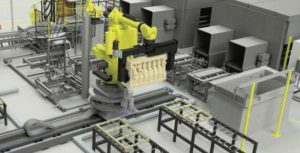 All the data collected throughout the process by the robots and the variety of inline instruments will be linked to specific castings. At the end of the process, the entire set of process parameters including operator information will be available for each casting,” explained Pieter du Plessis, CEO of Atlantis Foundries. “This process data will be analysed using Artificial Intelligence to predict various aspects of the castings such as material properties and sub-surface defects. Atlantis Foundries have partnered with DataProphet, a Cape Town based Company. The pilot project using Artificial Intelligence aims to predict sub-surface defects currently detected only after machining, and to identify the optimum process parameters to prevent the sub-surface defects occurring in the first place. The current model has a 70% success rate to predict casting defects, based purely on the raw process data. Castings with a high probability of sub-surface defects are identified, and additional inspection and testing is done to prevent the castings from reaching our customers,” continued Du Plessis. The start of the project is in the Core shop with a Fanuc M-900iC dipping robot linked with automatic coating control systems, supplied by Proservice in Italy. The core drying oven, also supplied by Proservice, acquires data for each core package. Once the core package exits the core drying oven, process data such as coating density and viscosity, drying time and temperature in each zone is available for each core package. After the drying process, core vents are drilled using a Fanuc M-20iA robot. The robot will, in future, carry instruments to inspect the various cores as well as the core assembly. After the vent drilling process the core package is assigned a unique sequential number from the production system Shopware. This unique number will be linked to all the data acquired for the core package. The final operation in the core shop is the palletising of the core assemblies prior to storage. For this operation a Fanuc M-900iC robot is used. In future, an instrument will be fitted that carries out a dimensional assessment of the core package. “During the latter half of 2017, Atlantis Foundries will install an off-loading robot at the shot blast machine. 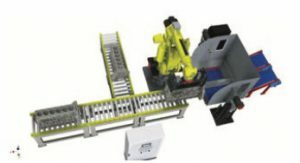 In addition to off-loading, the robot will use the spare cycle time to perform fettling of the front and rear face of the casting. Visual inspection is a thorn in the side of many Quality Managers, where any missed defects on a casting will end up at the customer, resulting in costly rework and sorting exercises. Atlantis Foundries export of all their castings to the USA and Europe, and with these long supply lines, visual inspection failures can be very costly if castings require rework or sorting at the customer. 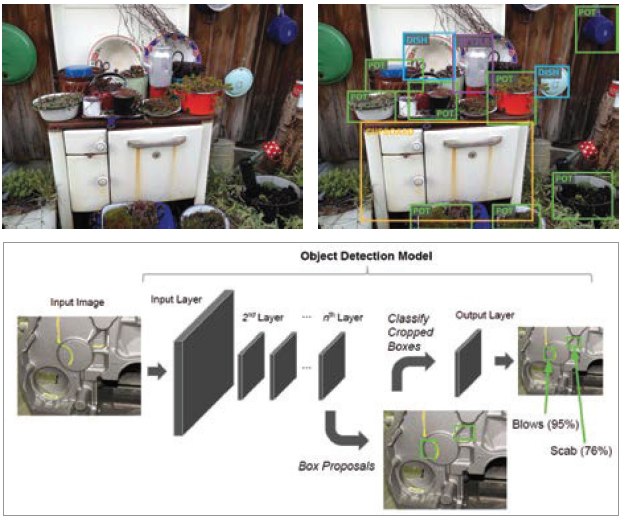 Modern convolutional neutral-network based object detectors can process a scene containing many objects of interest, locating each object and classifying them into distinct categories and objects. This technology can be broadly applied; from identifying separate objects in a complex scene, to determining the location and extent of a visual feature. Finding the correct process parameters for castings is a daunting challenge for any foundryman. The foundry process is complex and has many separate steps, with each step having many process variables that influence the quality of castings. “Determining the correct process parameters can be determined by following theory and using simulation software. However, theory and simulation software cannot account for all the process variations in a foundry. As we all know it is a careful balancing act, as one parameter change can solve one problem, only to create a new problem — every parameter has many degrees of influence. Different casting types also require their own unique process parameters based on their design. One approach to find the best set of process parameters is through trial and error, and given error this leads to trials and more trials.